Fighting pseudoscience in nutrition and health. Seeker of truth. I love reading about crazy diets, so I’ve decided to use my little forum to learn about them and share my research. The Alkaline Diet has been cropping up on my radar for a few years now. Like all good fad diets, this one has its celebrity adherents: Elle McPherson, Kelly Ripa, Victoria Beckham, even the high priestess of woo, Gwyneth Paltrow. Earlier this year, BBC Good Food magazine had an article promoting it – I was really disappointed because I had just bought a subscription to the magazine. Recently a friend who just survived a bout with colon cancer asked me about the diet because someone suggested she try it. 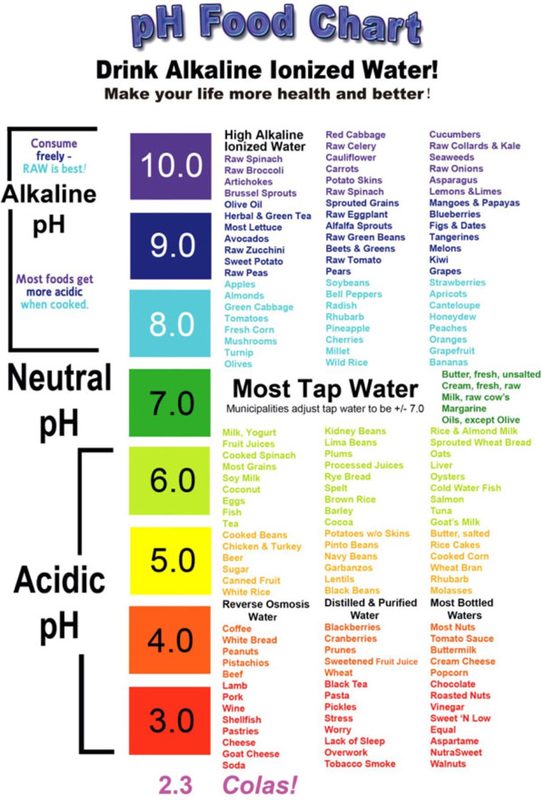 Proponents of the alkaline diet say that the foods we consume affect the body’s pH. In case you don’t remember what the power of Hydrogen is from high school chemistry, the pH scale measures how acidic or basic a substance is, on a scale from 0 to 14. 7 is neutral and all values below 7 are acid and all values higher than 7 are alkaline. What these proponents don’t understand is that there is no one pH for the entire body. Every organ and every cell in the body has its own pH. Blood has a pH of 7.35 – 7.45. The stomach, which is highly acidic, has a pH of 3.5 or less. The alkaline diet claims to help your blood maintain its pH level by eating more alkaline foods and less acidic foods. But that’s not how the body works. The only pH that consumption of food can change is urine – obviously the output can be changed by the direct input, but blood pH will not be changed by food consumption (3). Alkaline dieters often measure their urine pH with test strips. While this may make some users feel comforted, by seeing actual results of their adherence to the diet, it doesn’t show anything about blood pH (4). The website acidalkalinediet.net says that acid-forming diets are the cause of acidosis and the major cause of diseases like cancer, diabetes, and stroke. This is a red flag of pseudoscientific theories: several different diseases are attributed to one cause. The truth is that each disease is unique and has a unique cause. For the purposes of this post, I’ll talk briefly about acidosis and cancer. Acidosis (5) occurs when the body is producing too much acid or the kidneys can’t remove acid properly. Symptoms may include chest pain, palpitations, mental confusion, vision problems, nausea and vomiting. As you can see, these are serious symptoms, not just a little fatigue or lack of concentration that might make you want to change your diet to feel better. How do you develop acidosis? There are four types (6) : 1. Ketoacidosis occurs when someone is diabetic and their body produces ketones because they are burning fat for fuel instead of carbohydrates, 2. Lactic acidosis is what happens during intense exercise, 3. Renal tubular acidosis can happen to someone with kidney disease, and 4. Hyperchloremic acidosis, which can occur when someone has severe diarrhea or is abusing laxatives. Clearly, acidosis is generally a problem for people who are not healthy. Except for lactic acid buildup during intense periods of exercise, few of us will ever experience acidosis. The Acid Alkaline Diet website claims that “acid-forming diets are 95% of the reason for the development of acidosis”, and that “acidosis is the cause of most cancers” – this is a wild overstatement. Acidity is a factor associated with cancer, but not as a result of diet (7). While it is believed that 4 in 10 cancers are the result of lifestyle factors, such as diet, exercise, smoking, alcohol, and work environment (8) , there is no evidence that this diet will prevent you from getting cancer (9). Cancer occurs because of a combination of environmental/lifestyle factors, heredity, and sheer randomness. According to the Cancer Research UK website (10) , only about 9% of cancer cases each year in the UK are linked to diet (mostly cancers of the mouth, esophagus, stomach, and bowel). That’s not to say we should forget about eating healthy and just have burgers and donuts all day long, but the direct link between cancer and diet is rather weak. Alkaline dieters divide food into acid or alkaline depending on what type of “ash” is produced by ingesting the food. When we eat, energy and nutrients are extracted from the food, leaving behind an ash residue (11). This residue is either acid or alkaline, depending on the food. Acid-forming foods are meat, poultry, fish, dairy products, most grains and legumes, caffeine, sugar, and salt. Fruits and vegetables are alkaline-forming (12). While it’s certainly true that fruits and vegetables are good for you, it’s because they are nutrient-dense, not because they are alkaline forming. The alkaline diet seems very restrictive to me – it’s basically a raw vegan diet (oooh, another diet to debunk!). I have no problem with ethical vegans, but the vegan diet takes some work to do in a healthy way (see Ginny Messina, RD for more information). Most of the foods on the acid-forming list can be beneficial – fish, dairy, grains, legumes, even caffeine has nutrients and proven health benefits. It seems like restrictive diets are increasingly popular, and there is growing concern that they can lead to disordered eating. 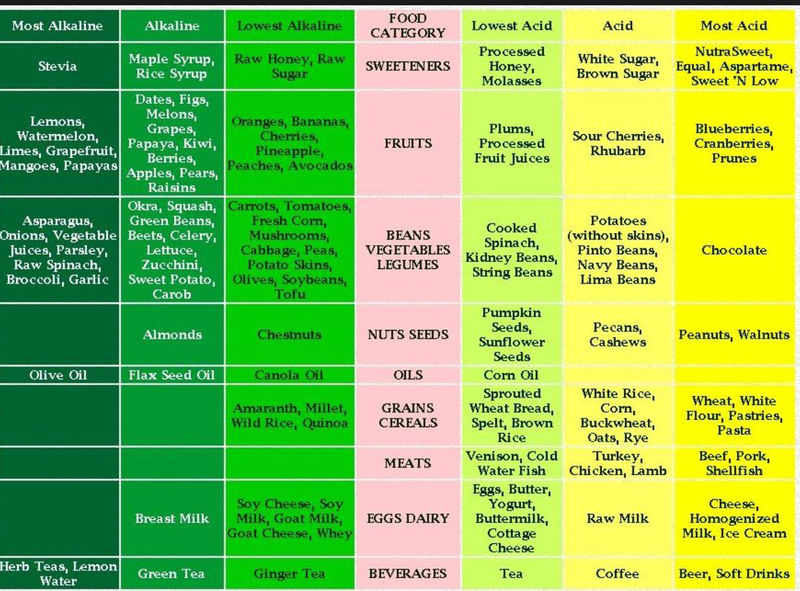 Another problem with the alkaline diet is that there seems to be no consensus on which foods are acidic and which are alkaline. For example, let’s look at blueberries – universally believed to be a very good fruit, full of vitamin C and antioxidants. The first chart – – the one that says “make your life more health (sic) and better!” shows blueberries as being highly alkaline, but the second chart says they are very acidic. They can’t be both, but since this diet has no scientific credibility, I won’t bother trying to research which list is more accurate. By the way, I love how the first chart, called a pH food chart, lists “stress, worry, lack of sleep, overwork and tobacco smoke” as acidic foods. The lists are also not exhaustive by any means. For example, some fruits and vegetables are omitted from both charts, such as raspberries and brussels sprouts, while others, like kale or sweet potatoes only appear on one chart. It has to be very confusing trying to follow this diet. To conclude, the alkaline diet is not a terrible diet because it does encourage the consumption of fruits and vegetables, which most people don’t consume regularly. But it also eliminates many beneficial foods like grains, legumes, and fish. Getting enough protein and certain vitamins and minerals would be really difficult on this diet. Personally, I prefer to look for ways to add good things to my diet rather than restrict consumption. I’ve found that when you eat enough of the healthier foods, you are satiated and have less hunger and cravings for the unhealthy desserts and treats that add calories but no nutrients to your diet. 1. Named in honor of “We Want The Funk” by George Clinton and Parliament Funkadelic. I’m a proud child of the 70’s! Health Coach? Or Life Coach 2.0?